When looking for the best Ethereum Wallet to store your cryptocurrency coins, you'll be pleasantly surprised that there are a number of good options. Ethereum Wallets can store ERC20 tokens as well as Ethereum Coins. With Ethereum having the second most largest market cap, it's popularity has soared in the past twelve months. This guide will review some of the most popular Ethereum Wallets and list the positives and negatives of each one. An Ethereum Wallet allows you to store your Ethereum-based cryptocurrency in a secure, private location away from hackers. When you buy Ethereum, keeping it on an exchange can be a risky move because there have been many times where these exchanges get hacked, or even shut down, taking your cryptocurrency with them. The most secure method of storing your coins is in a Wallet. Ethereum Wallets have many different types and features, so choosing the best one can become a bit confusing, especially if you are new to the cryptocurrency world. You can keep up to date with the latest Ethereum Wallets by reading the Ethereum sub-reddit for latest news and announcements. How does a Wallet work? A wallet works by having a Private Key and a Public Key. Your Public Key is usually your wallet's address, which allows other users to send you coins. You can give your wallet address out to anyone without fear of having your wallet compromised. Your Private Key, however, should never be given out to anyone. This key is what unlocks your wallet and gives you complete control over the contents of your wallet. If your Private Key is compromised, it means anyone can steal your coins. If your key is compromised, it's best to generate a brand new wallet with a new private key and transfer your coins to that one. Certain wallets will protect your Private Key from being stolen using various means and methods, but all come with different advantages and disadvantages. Also, not all wallets support all coins. Some wallets only support Bitcoin and others only support Ethereum. This article is based on Ethereum Wallets, which includes all Ethereum coins that use the ERC20 token standard. And many more. You can view a list of ERC20 Tokens here on Etherscan. Hardware Wallet - These wallets are stored on a piece of hardware off your main computer. Like a USB Stick. Web Wallet - These wallets are used via your browser and you interact with a website to manage your coins. Desktop Wallet - These wallets are software stored on your computer. Mobile Wallet - These wallets are software or Apps stored on your mobile device. Paper Wallet - These wallets are the ultimate offline storage wallets, with your private key printed on a piece of paper. Hot Wallet - Wallet is connected to the internet. Having a hot wallet that is connected to the internet poses more security risks than having a cold wallet, which isn't connected to the internet. Because the internet allows hackers to exploit vulnerabilities in website code, software code, viruses etc it means they can use these tactics to also steal your wallet's private keys. Once your wallet private key is compromised, they can access all of your funds and send them all to themselves. Here is a quick overview of the best Ethereum wallets in 2018. You can use this table to see the different features between each wallet and decide what is the best one for your use case. Remember, it's usually a good idea to keep your coins spread across multiple wallets, in the event that if one does get hacked, you won't have lost everything. If you're looking for a more detailed guide to Ethereum Wallets, check out our Ethereum Wallet Review below. This section will review and give an indepth guide into the different Ethereum Wallets. 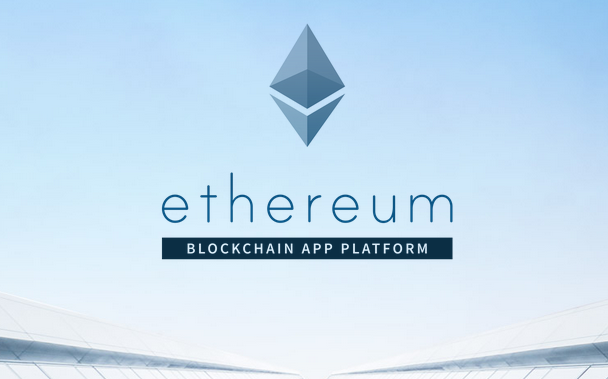 The Ethereum landscape is ever changing, so there may be newer wallets released all the time. This is just a guide to some of the most popular Ethereum Wallets currently available. MyEtherWallet is one of the most popular Ethereum Wallets currently available to users wishing to store and manage their Ethereum based tokens. Specifically, it supports ERC20 Tokens and allows you to add any new ERC20 Token too. Since it works directly in your web browser, it is supported on any platform. 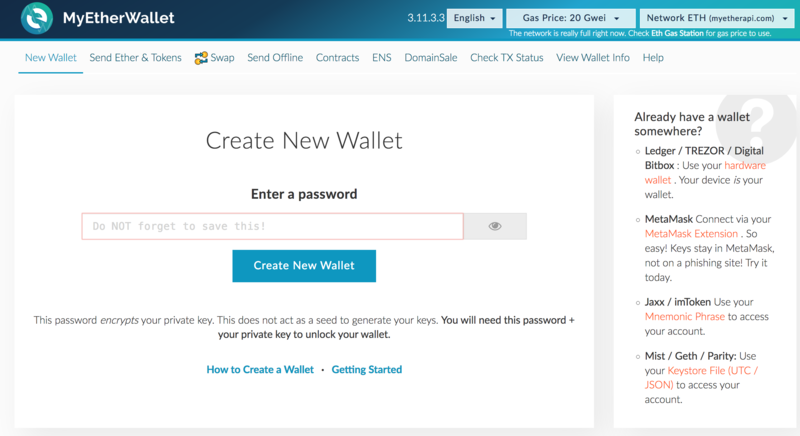 The process of creating a wallet is simple, fast and easy. It's a great wallet for beginners who are looking for something secure and supports a lot of the Ethereum ERC20-Tokens. MyEtherWallet was created in 2015 and is an Open Source client-side Ethereum Wallet. It does not store your Private/Public keys on their server and instead provides an interface for you to interact with the Ethereum Blockchain. As the name suggests, it does not support any other currencies other than Ethereum and ERC20-Tokens. 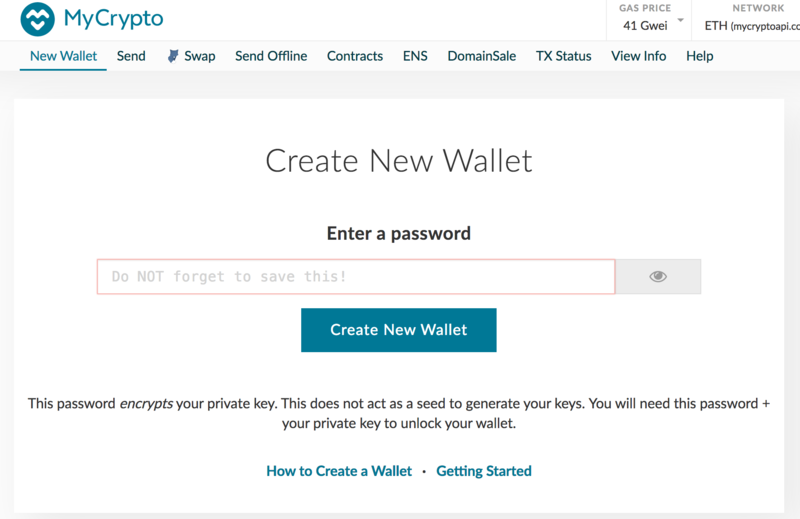 For extra security, you can also use MetaMask with MyEtherWallet, which makes it so your Private Key never is used on the MEW website. 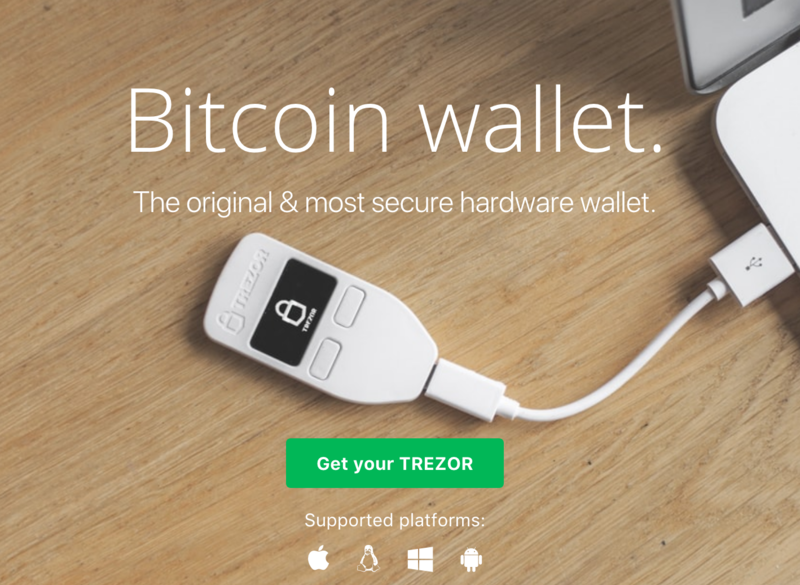 One of two main industry leaders, the Trezor Hardware Wallet is a device that allows you to store your coins offline and away from hackers. A type of "cold storage", the Trezor Wallet costs around $100.00 USD to purchase and can store not only Ethereum coins, but also Bitcoin, LiteCoin and more. The Trezor wallet does support ERC20 Tokens too, so you can keep coins like Tron, OMG, Binance and Qtum in offline wallet too. It is one of the most secure devices due to your private keys being stored offline, giving hackers no room to compromise your wallet. The device itself comes in a variety of colours, including black and white. Supplies for the device can sometimes go in and out of stock due to demand, but keep checking their website and Amazon for new orders. The Trezor Hardware Wallet also boasts other useful security features, like 2-factor authentication, password manager and more. The device plugs into any computer via USB and comes with a recovery seed to help restore your wallet. 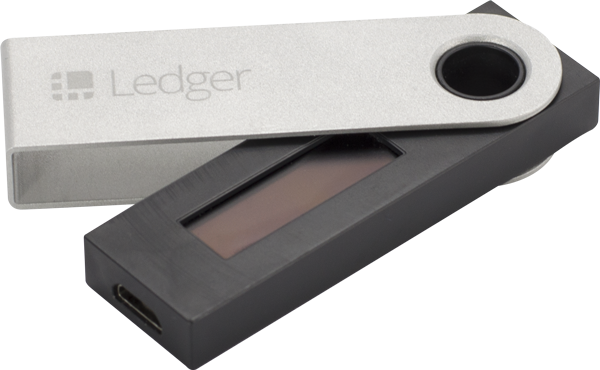 The Ledger Nano S is a hardware wallet of a series of products made by Ledger. It's one of the newest products on the market and it comes with great support for Ethereum coins and tokens. It connects to your computer via USB and is above the size of a keyring. This cold wallet will never expose your Private Key, preventing hackers from gaining access to your coins. You can use the wallet to send and recieve coins, check balances and manage multiple addresses from the same device. It also has a Pincode feature which locks your wallet even from those who might have access to the hardware wallet, preventing your coins from being lost if the physical device is stolen. Stocks of the Ledger Nano S can become limited. If you preorder the device, yours will usually be shipped out in batches when the stock finally arrives and is ready to be used. We recommend NOT buying used hardwae devices on sites like Ebay. There have been incidents of people losing all of their coins from compromised hardware devices, so please check to make sure your device hasn't been tampered with if you're buying from another vendor. They recently announced a refreshed update of their Ledger Wallet applications, supported on Windows, MacOS and Linux. 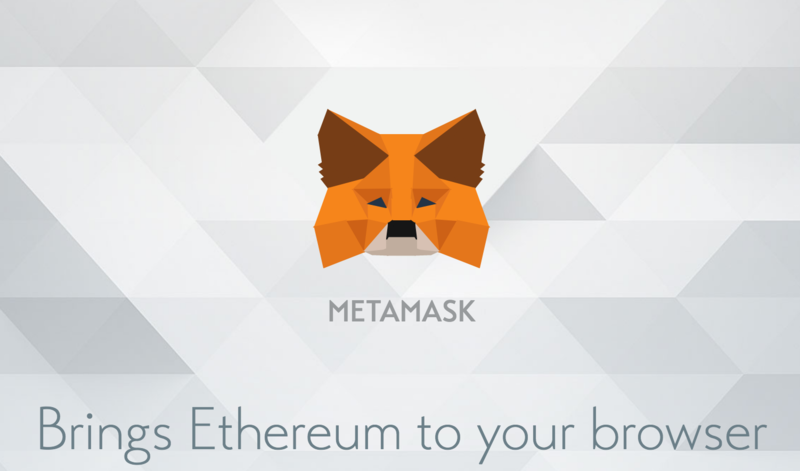 MetaMask is a wallet that works within your browser as an addon. It's supported for FireFox, Chrome and Opera. It supports multiple accounts and allows you to sign and verify transactions on websites that implement the add-on. MetaMask works well with MyEtherWallet, allowing you to securely transfer funds to different accounts. It prevents from DNS attacks because your Private Key is managed by the addon and not sent to MyEtherWallet. You can view ERC20 tokens in MetaMask too. However, you will need to use another service in conjunction with MetaMask to send them to other wallets, such as MyEtherWallet. MyCrypto is a fork of MyEtherWallet that occured in 2018. It's a relatively new service but uses the Open Source code of MyEtherWallet. This means it carriers pretty much the same features of MyEtherWallet and now is attempting to improve upon those in it's own vision. The team behind MyCrypto are trying to make it the best web-based wallet on the internet, many of them ex-exmploees of MyEtherWallet. You can use Trezor and Nano S hardware wallets with it to confirm transactions and keep your keys safe. The competition between the two wallets can only be a good thing in order to improve wallet security and usability for the future. 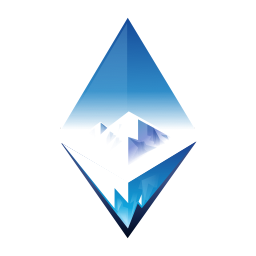 The Mist Ethereum Wallet is the official wallet from the Ethereum Foundation. It's a software Wallet that can be downloaded on your computer and used to store your Ethereum coins on. It requires syncing to the Ethereum network, meaning you'll have to wait for your computer to finish syncing to the nodes on the blockchain. You can use Mist to send and recieve coins. You can add different ERC20 tokens via the contracts tab as long as you have the contract address of the token you're trying to add. It is one of the most popular desktop wallets currently available. Unlike most wallets, Geth (Go-Ethereum) is strictly a command line based wallet, meaning to interact with your wallet's tokens you need to use special commands in the terminal on your computer. If you're used to using command line based tools, you may feel it more natural to use Geth. Geth does come with all the features of many of the UI based wallets, including managing multiple accounts, storing of ERC20 tokens and checking/sending of coins. With it being Open Sourced and one of the original founding implementations of Ethereum, it has stood the test of time. If you have experiencing with managing Linux systems, you might find this wallet worth your time. You can see examples of how you interact with this wallet from their wiki page on managing your ethereum account. The Exodus Wallet is another wallet which you can download to your computer and use to store your coins on. 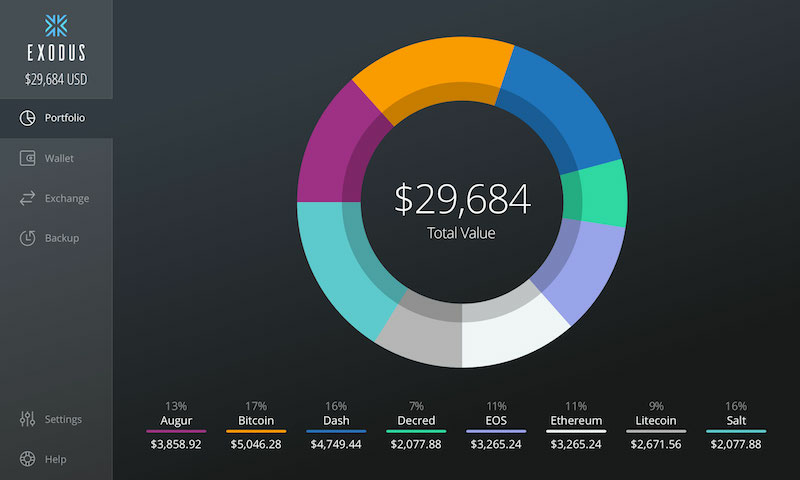 It supported on Windows, Mac and Linux and allows you to manage your Ethereum based coins. What makes Exodus Wallet exciting, however, is that it has implemented support for ShapeShift. With the implementation of ShapeShift, it allows you to buy and sell coins directly from the wallet. ShapeShift connects directly to exchanges and allows you to list your tokens for sale securely. Like other exchanges, it doesn't support every coin but it does support the most popular ones. What makes Exodus stand out from others is also it's beautiful UI. It's very user friendly and has been designed to be used by people who have never used an exchange before. 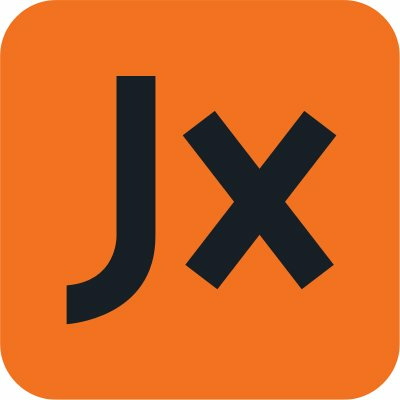 Jaxx is a wallet with a great mobile/tablet versions available, which makes it great for managing your crypto on the go. It supports Ethereum and other major currencies. The great thing about Jaxx is you don't even need to sign up and create a new account, just import your wallet keys and get started. Jaxx also allows you to exchange your Ethereum for other currencies. With it's simple interface, you'll never miss that next pump or crash when you have you wallet at your fingertips. This wallet is one you can make yourself. We're actually being a bit cheeky here, but anyone can make a paper wallet. All it requires is you to print your Private Key and Wallet Address onto a piece of paper. With this ultimate form of cold storage, your wallet is secure from hackers as it is not connected to any device. You just have to make sure you don't lose your piece of paper! 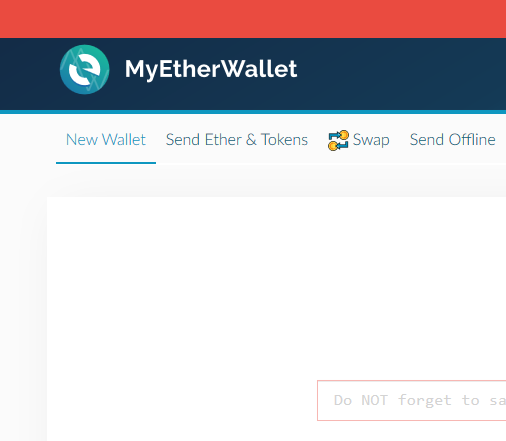 MyEtherWallet allows you to print off your Wallet details with a simply click of a button. If you're looking for a wallet for your iOS device, including for iPhone X and iPad, then we have created a list of all working wallets below. When looking for wallets in the app store, you want to be wary of scam and fake versions, as these apps will try to steal your private keys via phishing. If you think you have a better suggestion for the best Ethereum Wallets on the market, then post a comment below with your suggestion. We'll review them and see if they can be added to our list. All Wallets must have been around for a minimum of six months before we consider adding them to the list. MyEtherWallet Swag - Competition Winner! You should check out Fetch (https://hellofetch.co). It's new. A desktop wallet that is super simple to use and also makes trading tokens possible with just one click. You see prices on 20+ exchanges and can make the trade with one click right from your desktop. Super simple.